I’m still a little baffled by my recent experience successfully completing the Quicksilver 50 miler. Like much else in ultra-running it appears counter-intuitive. Maybe I was just lucky. Isn’t 50 miles supposed to be way harder than a marathon? Shouldn’t the body break down after 8 ½ hours of running, leading to some sort of self-actualizing moment? I think I heard trail running is growing faster than any other sport. For those of you looking for a challenge to get you motivated to get fit, I offer 12 reasons why your next challenge should be an ultra instead of a road marathon. It seems like every man, woman and child has run a marathon by now. Tell someone you’re running a marathon and they’ll just nod and wish you luck. If you say you’re running an ultra, you invariably pique their interest. Almost no one even knows what an ultra is, let alone has run one. When you explain its longer than a marathon the average person’s eyes widen in awe. Bonus: the easiest ultra is 50km, which most people will confuse with miles, so you may well get credit for 50 miles, even though you’re only running about 31 miles. After your first marathon, it’s all about how fast you can run it. Can you qualify for Boston? Because no one know what on earth an ultra is, they have no idea how long it should take. Especially if it’s in kilometers. Add in the fact that every ultra trail is different with staggeringly different terrain, and that when things go wrong, the minutes can really add up, and you have completely unpredictable race times. And once you start talking about being on your feet for over 5 hours, everyone is so amazed by the duration, they never get around to computing the velocity. If you’ve ever run a road marathon, if you don’t get injured trying to make it to race day, you know how beat up you are after you finish, hobbling around. Not so with ultras. You can even start training for them injured and still finish just fine. After my first 50km race, I ran 6 miles with my wife the next day. 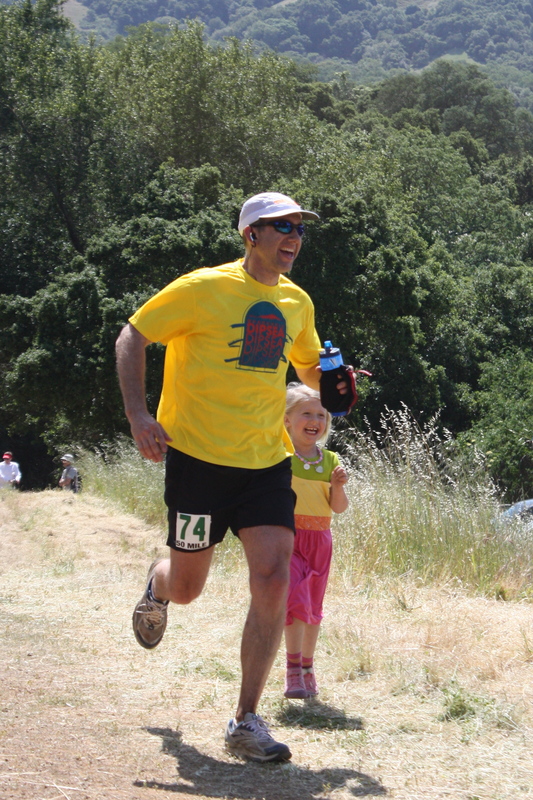 A week after Quicksilver, I ran 10 minutes faster than I ever have on one of my favorite 13 mile trail courses. They say you should only run 1 or 2 marathons a year because of the damage it does. There are people running ultras every other week. My theory on this one is that in a road marathon, if you’re running for a specific time, you’re redlining the whole way. You want to cross that finish line, completely spent without a drop of energy left in your body. On an ultra, you always run within your means to avoid blowing up. To give you a sense of this, if I put the hammer down in a trail run, I invariably get crippling calf cramps after about 2 ½ hours, no matter how much water, electrolytes and/or salt tabs I take . As soon as I back off 5-10% in effort, I can run 8 ½ hours without cramping. Just like a car can only redline for a short time before overheating, we humans can only keep going if we stay consistently below the redline. There’s a certain degree of animosity in road marathons between the runners and walkers. Not so in ultras. And only the top contenders can actually run up those hills. Mere mortals keep heart rates under control – see the comments on redlining above. If you want to finish, don’t waste your energy running up the hills. Once the perceived exertion, or heart rate (if you’re using a HR monitor) hits your lactate threshold, time to back off and walk. But learn how to bomb the down hills – such an easy way to make up time. If you’ve ever been in a marathon, you’ll know there’s a large number of extremely tense people. They are very stressed about running their best possible time. At an ultra, people are there to have a good time, take it easy, and enjoy the scenery. There is no prize money at stake – everyone gets the same t-shirt or finisher’s medal. So there’s just a ton of goodwill and camaraderie. The proportion of folks in their fifties, sixties and seventies running ultras is way higher than for marathons. I’d like to think this is because they’re just plain wiser. And they obviously have a lot of time on their hands. But given all that free time, the running must be pretty fun for it win over all the other recreation options they could choose. And finally it can’t be too bad for you, if seventy year olds are still doing it. In the world of marathons and triathlons it’s all hi-tech energy drinks, bars, gels and powders. Hardly what Michael Pollan would call “food”. At ultras there are typically bananas and oranges and cookies and potatoes and PB&J sandwiches at aid stations. There are tales of people eating pizzas at aid stations. Chocolate milk, turkey sandwiches and burritos are popular. Not only do you need a ton of food if you’re running for this long, but you’re stomach tends to enjoy real food much more than gels or other concoctions. At Quicksilver I couldn’t get gels to go down, but my body was just taking as many bananas and potatoes as I could eat. Because you’re not redlining, your body can digest more complex foods. And of course, if you’re running all those miles and burning all that fat, you get to eat more in general, which is a huge plus. Every time I’ve tried to add speed work to improve my marathon times, I’ve got injured. With ultras, if you’re going anaerobic, unless you’re actually in a position to win a race, you’re going too fast. Just not necessary. Ok, you need to run a lot of hills. But the best training is literally time on your feet learning how to run long, easy and smooth, and how to burn fat. You’ve got about 2000 calories available as glycogen from carbohydrates, but 50,000 from fat. No amount of carbo-loading is going to meet your needs, so your body has to be comfortable using those fat stores – that means you need a few long (3 hours plus), slow training runs. Despite these long runs, you really don’t need to run that much. Arguably you can get by with less than you need for a marathon. 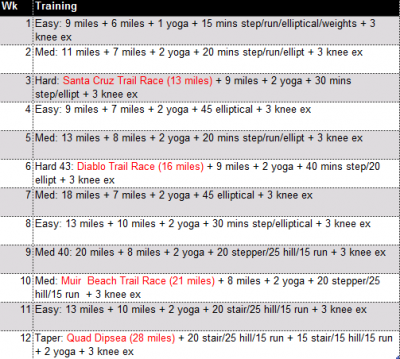 A lot of marathon programs involve up to 6 days a week of training with mileage in the 30-50 miles per week range. 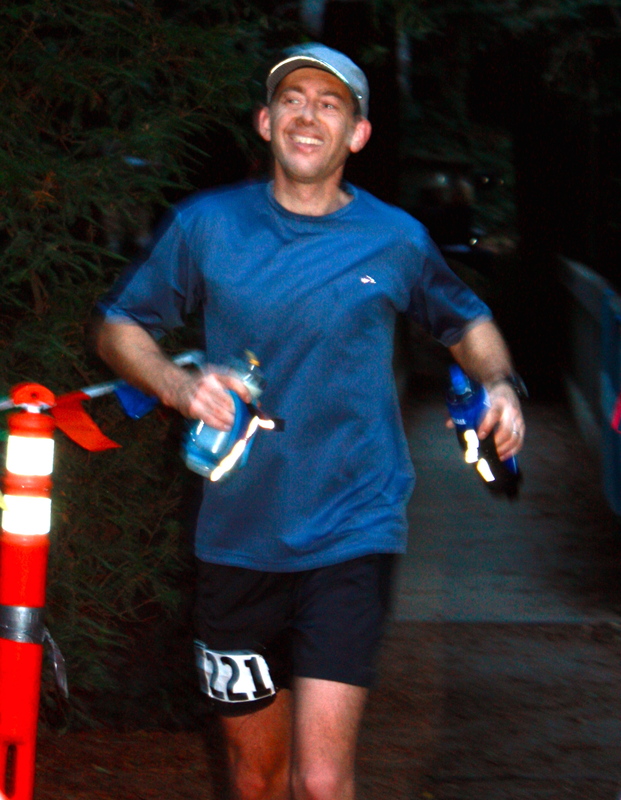 Much like my training for the Quad Dipsea, I ran Quicksilver with 12 weeks of training in the 25-50 miles per week range based on just 3 days per week of aerobic training: a long run (12-32 miles) on the weekend, up to 1 hours in the gym with some combo of bike/elliptical/stairclimber/ fast hill walk/ fast run, and a medium 6-10 mile run. I even stopped the yoga and stretching. I periodize each 4 week bracket into 1 hard, 2 medium and 1 easy week, and do 2-3 longer long runs (18-32 miles) and 1-2 shorter long (12-16 miles) runs per week. I try to do 2 races as part of the prep – around 20 miles long for a 50km, or 50km for a 50 miler. These build confidence and simulate the challenges of trying not to run too fast and how food and drink go down when you’re running a little harder. . As I said, it’s all counter intuitive. How can one do so little, and still run strong for nearly twice the distance and over twice the time of a marathon? Trust me it’s a lot more fun to run 3 hours in the woods than 3 hours on the road. The scenery is way better. You’re mind calms down in amongst all that nature. Plenty of time to think through all your problems. You get to witness the passing of seasons as wildflowers come and go, the trails get muddy and dry, the creeks and waterfalls get full and then empty. And because you’re not redlining, no need to spend the afternoon in bed recovering. In your first ultra, don’t be tempted to try to outrun the old-timer in a ratty old cotton t-shirt, cotton shorts and beaten up no-name sneakers. I tried this on in my first 30km trail race, and was trashed by a guy matching this description who ended up coming second in the 50km on that day. Mind you that was 10 years ago, and the front runners now are typically sponsored, and most people are wearing all manner of technical gear. If you’ve got the cash, it’s can be fun to buy a bunch of gear. It’s just nice to remember you don’t need it. If the Tarohumara regularly run 50 miles in sandals and a tunic, so can you. This is a bonus. You can appear amazingly well read even if you don’t like reading (which I do, but if you’re not travelling, and if you fall asleep when trying to read horizontally, it can be hard to find the time). Sometimes it’s great to just run for the sheer pleasure of it: no watch, no HR monitor, no headphones, just taking in the sounds and sights of the forest. Other times, a good book can be a very enjoyable way to pass the time on a long run. I’ve enjoyed listening to and learning from: Crush It!, Outliers, The Big Short, The Omnivore’s Dilemma and most of all , Born to Run on my long runs this year. If you’ve already made the switch to ultras, I’d love to hear your reasons for switching. If you’re thinking about it, what’s stopping you? Have fun out there.